In the near future, the surface of the earth is decimated by nuclear war and the only refuge for humanity are floating fortresses created to drop those same bombs that made the surface uninhabitable. Now, 250 years later, humanity clings to life on just two remaining fortresses, Aries and the Hive. 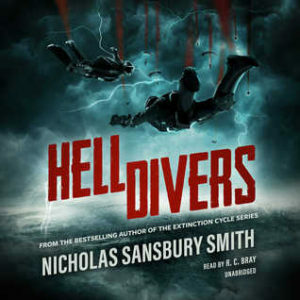 The ships are kept afloat by sending Hell Divers to the irradiated surface on suicide drops for supplies and replacement parts. Each ship is a world unto itself but when there are only two ships in the world and the total population of humanity is less than a thousand souls the Hive is obligated to respond to a distress call from Aries even though it’s coming from ground zero of the apocalypse, a place called Hades where no diver has ever returned from. It’s up to X, the longest tenured diver on the Hive, and his team to find the parts necessary to keep humanity from going extinct. To make matters worse, X finds out that he isn’t the only thing alive on the surface. I found this to be very similar to Metro 2033 in both the cramped home of humanity as well as the irradiated surface and “other” obstacles. It even ends in a similar way. Not the same, but reminiscent. No spoilers. X is a typical tough guy hero who has survived against all odds – at least until this new threat shows up. The other characters are vaguely interesting, but it’s all about what happens on the surface. This is a popcorn book, filled with action and suspense, adrenalin and fun. X-pect that and you’ll have a great time. I enjoyed it and will probably pick up book 2 in the future.